Increasingly European companies are demanding that North American exporters send their goods to Europe on euro pallets. Some companies are even instructing that goods sent from North America to Asia be sent on euro pallets, reflecting the truly global reach of the europallet standard. Why are euro pallets so special? ทำไมต้องใช้ยูโรพาเลท? Below are six of the most important facts about europallets and why European companies are asking for them. Commercial Value: In contrast to stringer and other American pallet types, europallets have significant commercial value for importers, because they can forward them on directly to customers, or exchange them for newly reconditioned europallets. Functionality: Many European warehousing and logistics companies have automated material handling systems that accept only genuine, officially inspected and repaired euro pallets. Companies with these systems incur significant costs and delays when they must transfer products from other pallet types on to euro pallets. Shipments of high-value and/or hazardous goods such as chemicals, medical devices, and pharmaceuticals are often processed at such advanced facilities in Europe. Disposal Taxes: Under the European Union's Packaging Waste Reduction Laws, Germany and other EU nations levy significant disposal taxes on pallets that cannot be reused. 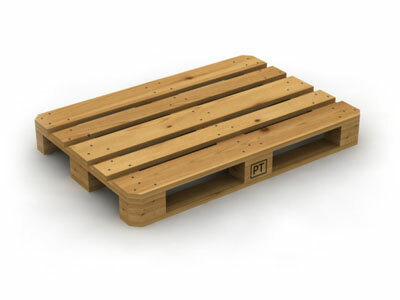 In most cases, American pallet types create direct and indirect disposal costs for European importers, due to the impracticalities involved with the reuse and/or recycling or these pallets. Because they are designed for reuse, euro pallets are not subject to these taxes. Strict Regulations: The non-profit European Pallet Association (EPAL) strictly regulates the construction and repair of euro pallets worldwide, to ensure uniform quality standards for long-term, safe reuse. ISO Accreditation: The Europallet is one of only six pallet types recognized by ISO. Traceability: Traceability of each unit is built-in to genuine euro pallets. Euro pallets with counterfeited markings are aggressively prosecuted in Europe. Users as well as authorities can request inspection of any suspect europallets. The symbol of national railways authorized to attribute their mark according to UIC rules. The quality label protected by the International Bureau for Intellectual property, Geneva, as union trademark under No. 617 158. The protection of the trademark EPAL by the EU office OHIM in Alicante (Office for Harmonization in the Internal Market - Trade, Marks and Designs) is published in the leaflet for community marks No. 1698 of 9th March 1998, page 117. Based on agreements with the railways EPAL has the right to grant the trademark and railway symbols such as “DB” in recognition of the marking rules of euro pallets. EPAL also has the right to pursue any trademark infringements. Any blocks exchanged during repairs must also bear the protected trademarks. Producers and repairers of EUR pallets must be licensed to produce or to repair and have the right to use the protected trademarks. Abuse or imitation of the protected trademarks shall be pursued by law. We have brand new and used Euro Pallet , These pallets are ISPM15 compliance with IPPC Certificate and stamping. Please call our hotline 081-8188777 for any information you may need.